After seeing Furions ETC list I started wondering if we can pull the dubble lvl2 caster off without using the Book of Hoeth. We play usually 2000 point games but never more. At 2000 point I find proper character balance quite hard. I bought and built a Anointed on Flamespyre Phoenix after Furions succes at the ETC but I have trouble fitting him into a list because of his high cost and the need for a second caster beyond a lvl 2. 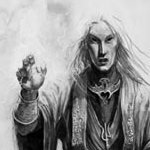 Is running a non loremaster/archmage build impossible in 2000 points? 1616 in total. slightly less than 400 points to play around with. This should probably go into a Frostheart and RBTs or RBTs + Eagles or something like that. Sadly our tournaments don't allow the 50% Lords and therefore our gaming group also doesn't and further more models of 13 points and more can at max have a unit size of 15 and maximum 10 cav models per unit. So all standard high elves builds are out. No silverhelm bus or white lion/phoenix guard blob. MSU is there for the way to go. But could a expensive Anointed be worth it in such a set up? That makes it harder. I don't know how to build an Anointed list then. You could go 2x L2 on foot with Shadow Warrior bunkers. Sadly our tournaments don't allow the 50% Lords and therefore our gaming group also doesn't and further more models of 13 points and more can at max have a unit size of 15 and maximum 10 cav models per unit. So all standard high elves builds are out. Wow, that 15 model rule is really dumb. That hits elf and dwarf elites and almost no one else. It could potentially hit WoC lists, but theyd do fine with a unit cap of 15 anyway... and would be more than happy to just switch to chariots. I can't imagine how dwarf armies would even function except as the purist, most annoying-ist gunline. All vanguard lists are unplayable. Any reasonable high elf build is destroyed (although all the cheesy dark elf ones are just fine). Who came up with that comp? They do realize that high point models are already comped due to their point cost, right? Being high cost isn't an inherent advantage in itself. And I would have a talk with the TOs about 50% lords. That's Warhammer now. There's comp, and then there's playing another game. Playing at <2000, with the restrictions you've been given, you're going to end up with a 6th edition list... a bad one at that. I would spam 10 elf units of silver helms and hope. The unit size comp is meant to make every unit capable of beating each other in combat, our gaming group is very anti hordes as many believe its impossible to field non horde armies and still compete. Second the group is extremely uncompetitive so most conventional wargaming wisdom is lost on a big part of them. Our TO has taken a clear stance on the 50% lord issue, he organizes the tournaments and nobody is forcing you to enter his tournament hence the comp acceptance. The comp itself isnt the worst and everybody has accepted it for now. I am now running a MSU list with a block SM, a block WL, dragon princes and either teclis or AM/lvl2 set up. It works in this setting but it takes planning. Our units smother most units in a direct fight but cant handle too much shooting or multi charges. Does anybody has tips regarding MSU play with these conditions or thoughts about a Teclis list with these restrictions in mind? One unit I would try if I were you is a unit of 15 PG, full command, razor banner. Comes in at 300pts, so a bit big for a true MSU army. But given the comp restrictions, that unit is absolutely awesome. It regularly performs well for me in a setting with lower comp. It has some issues with very high armour save models, since they're only S4 AP. But against other units they are great. 4+ ward makes them about as resilient as they can get. And 16 ws5 attacks that reroll vs all units except for other ASF units tend to kill enough to win most fights. This unit is often my best performing unit in the game.